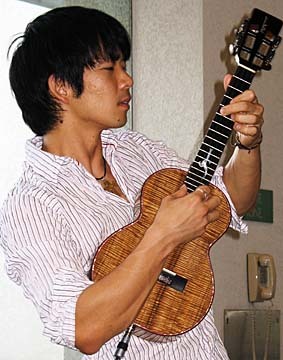 JAKE JAMS: Jake Shimabukuro played selections from his new album, "Gently Weeps," Saturday at a party before his concert at the Hawai'i Convention Center. Guests received a limited-distribution CD single promoting "Hula Girl," Jake's next movie soundtrack. 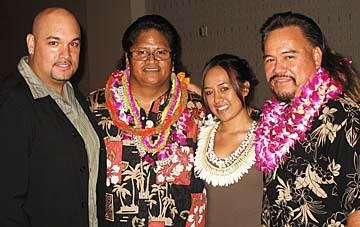 A GREAT SHOW: Kutmaster Spaz, left, congratulated Ledward Kaapana, Raiatea Helm and Sonny Lim after the three 2006 Grammy Award finalists played an informal set Sept. 27 during the Hawaiian Grammy Awards Banquet at the Hawai'i Convention Center. Helm's exquisite falsetto renditions of "'Ulupalakua" and "Kalama'ula" were highlights in the trio's jam session. Kaapana entertained with his showmanship on guitar, and Lim distinguished himself as the lead vocalist on "Hi'ilawe." SURPRISE! : Hawaii model Giselle Pineda surprised her boyfriend, Robb Trauger, with a party in the Lewers Lounge at the Halekulani on his birthday last Friday. Richard Cheese of Richard Cheese & Lounge Against the Machine was an invited guest, but the hotel management made him leave because he wasn't wearing long pants. 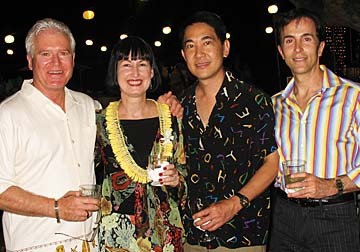 NIGHT IN CUBA: Bill Nichols, left, and his wife, Deena, talked with Mark Wong and Guy Merola at "Hot Tropic Nights," a Cuban-themed fundraiser for the Honolulu Symphony held Sept. 24 at a Honolulu social club. Supporters enjoyed Cuban food, Latin American music and a G-rated floor show in an evening dedicated to memories of night life in pre-Castro Cuba.